Wild Beast Point: an exposed place where currents split. 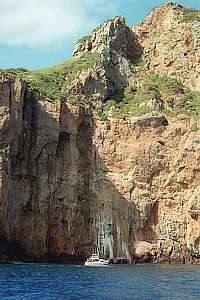 Ann's Rock: an exposed pinnacle aside a deep basin. 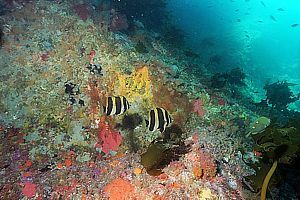 Cleanerfish Bay: plenty of good diving at safe depths. 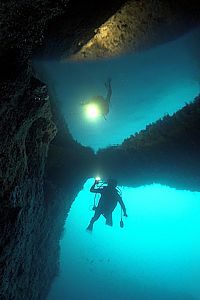 Middle Arch: safe diving in one of the nicest archways, also for night diving. 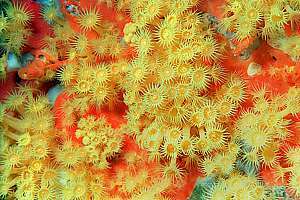 Dark Forest: a shaded community with shallow deep-reef habitat. Northern quarter of the Poor Knights Islands. Wild Beast Point is the northernmost tip of the Poor Knights, so named because of the bronze whaler sharks frequenting this area in summer. It is a place where the island splits the current, a cauldron of turbulence and wild water, and therefore seldom dived at. 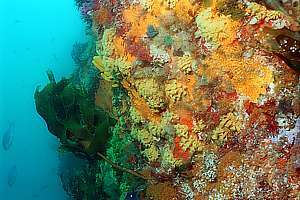 But underneath extends a sloping kelp platform that on the western side drops away in a steep abyss. This side is most interesting because of its relative shelter and strong currents. Boats cannot anchor here and need to idle around, waiting for divers to return to the surface. Small boats can anchor on Ann's Rock, from where one can swim against or with the currents. Make sure you can make it back, even if the current changes. Wild Beast Point is where shoals of fish swim into the nourishing current, alternatively seeking refuge in the relative shelter of Maomao Bay. Maomao Bay is deep (70m) with large boulders rising to 40m, and it offers excellent sleep-outs for the numerous pink maomao found here. f216602: Wild Beast Point seen from the east. 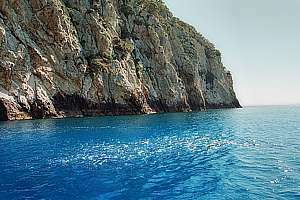 In front is a sloping platform over which the swell rises to colossal heights. Notice the very high grey splash zone. Not a nice place to dive. f216603: Wild Beast Point, seen from the north towards Northern Arch, in the middle of the picture. 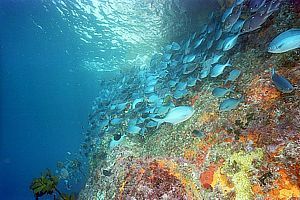 On this side one can dive a picturesque wall, surrounded by countless plankton eating fishes. It is a tricky dive. 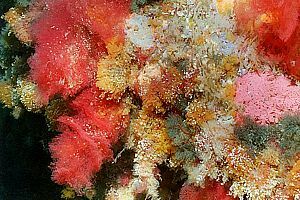 f042712: on the wall one finds a rich community of golfball sponges and yellow antler sponges, and beadlet coral, a gorgonean. f048724: the pink maomao here find divers an interesting diversion, as they come up slowly from the deep to investigate. 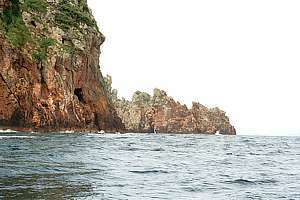 Maomao Bay is deep and its walls sheer, with a single rock poking up alongside a steep wall (named after Ann Roberts, married to fish scientist Clive Roberts). 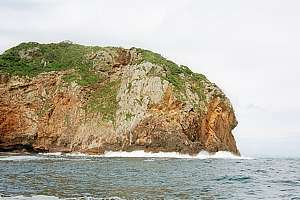 Almost impossible to anchor outside the surging swell, Ann's Rock is accessible only during very calm seas. 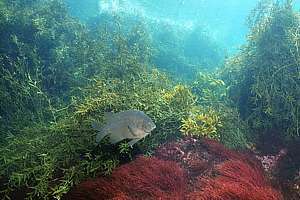 The rock itself has no redeeming features: a monotonous expanse of strapweed and stalked kelp. Northern Arch is a geological impossibility: a strictly parallel cleft through a rocky promontory, 6-8m wide and 40m tall. How can that be explained? The promontory stretches out westward across the current, and not surprisingly, the currents can run swiftly through the archway and around the promontory. Boats knowing the locality well, anchor carefully on some of the large boulders that rise up from a 70m deep bay, as an anchor is too easily lost. Thus most diving is done from the northern side, and this is possible only when shelter prevails. 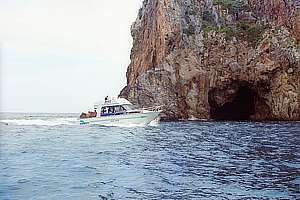 When done from the southern side, also Cattons Cave can be explored. 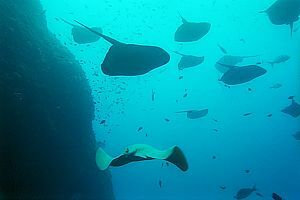 Most visiting divers have had their training in warm tropical seas with light wetsuits and light weight belts. Here in NZ you will wear a 7mm wetsuit with 10-14kg of weight on your belt. That means that you have a correspondingly large air bubble of 10-14 litres around you, and this air becomes compressed, making you heavier. For the first ten metres you become 5-7kg heavier. At 30m depth you are 8-12kg heavier. To compensate, you will inflate your buoycomp, and usually too late, when you already begin to fall. Conversely, you deflate too late, resulting in a deadly rapid ascent. You MUST be compensating your buoyancy ALL THE TIME! When in trouble, hold on to the rock or stalked kelp. 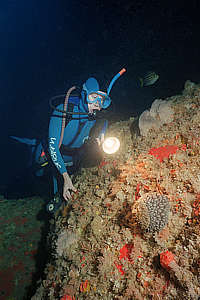 Most visiting divers do not have adequate physical fitness. Here you are diving in a truly open sea, with waves and currents. It is strenuous and you can easily get into trouble. Make sure that you swim against the current on the way out, in order to return with the current on the way back. Most importantly, swim from the boat to the wall first. Then come to rest before going down. It may take a few minutes, well spent. The bottom is deep and the walls sheer. You cannot easily find a ledge to rest on. 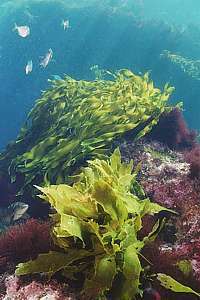 So make it a habit to hold on to a kelp stipe until you are completely rested and evened out. The current in Northern Arch can be unpredictable and also strong. Make sure you proceed with care. The bottom of the Arch is deep and you can too easily end up there (36-40m). Northern Arch is not suitable for night diving. f012701: Northern Arch seen from its northern side. Boats usually anchor on the left margin of the picture. From there it is a 30-40m swim to the archway, with rich seascapes in between. f048733: a caleidoscope of coloured fish: red-orange golden snapper, pink maomao, blue maomao, blue and green two-spot demoiselles and grey porae. Nowadays even large snapper can be encountered. 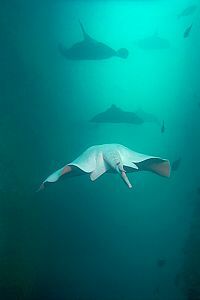 One of the widely plublicised attractions of the Northern Arch is the presence of a large number of sting rays, apparently swimming around aimlessly. Much has been speculated about why they are there: pre-mating behaviour, socialising, playing and more. But they have not always been doing this, as it began some time around 1990, as observed by myself. And in recent times, their numbers have declined sharply. So what is going on? Read more about The Mystery of the social stingrays of Northern Arch. For the lucky visitor, the stingrays are either hovering in one place or slowly flapping around, while taking little notice of divers. Don't be afraid, as they skillfully dodge you, if even by a few centimetres only. f011933: a few short-tailed stingrays (Dasyatis brevicaudata) in Northern Arch. The white one is an albino. f011933: a rare photo taken with a 50mm lens, showing 24-26 stingrays in a single image. The white one is an albino. f020537: young demoiselles bunched up to the margin of the cave's shadow in order to remain invisible to marauding gannets. f024134: Northern Arch can be spectacular for its large blue maomao schools, who come here for a rest. 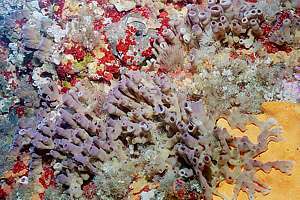 f020516: at 40m depth, the rocks are covered in sessile filterfeeders like these beadlet corals and golfball sponges. f024116: on the bottom at the northern side of the Arch is a bronze plaque in memory of John Catton, one of the early explorers of the Knights. 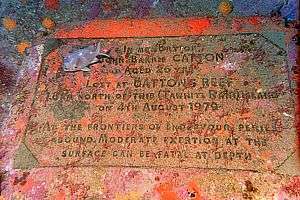 f020517: "In memory of John Barrie Catton aged 26 yrs. Lost at Cattons Reef 1.8km north of this (Tawhiti Rahi) island on 4th August 1979. At the frontiers of endeavour, perils abound. 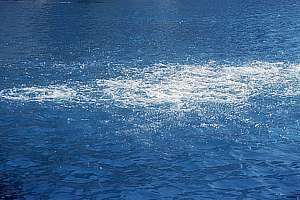 Moderate exertion at the surface can be fatal at depth." 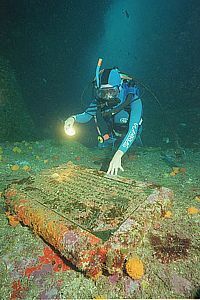 John Catton disappeared on a very deep reef NE of the Poor Knights. f020511: ten short-tailed stingrays hovering inside Northern Arch. At the best of times I counted 53. Read more about what they are doing in The mystery of the social stingrays. f048708: as currents veer along the promontory, a rich community of filter-feeding fans can be found no deeper than 30m. f042717: beadlet gorgonean fans and demoiselles passing by. 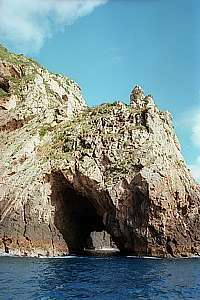 Named after veteran explorer/diver John Catton, this small cave is found in a corner where the promontory joins the northern island. From the outside hardly visible, it is a vertical slit that can be entered. Once inside, the slit rises all the way to the surface and ends in a pool of brown fresh water. 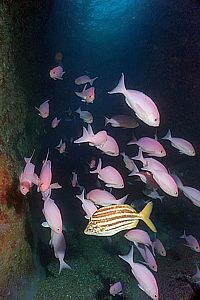 The cave is a hideout for groupers such as the yellow banded perch and black spotted groupers, now rare on the Knights. An uneventful stretch of coastline stretches between Northern Arch and Middle Arch and is called Cleanerfish Bay. 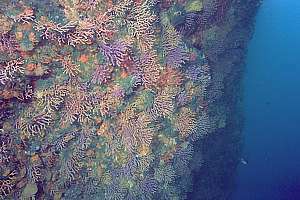 Although not frequently dived, it provides some good divable habitat with enough variation and pinnacles worthy of exploration. At least the blue maomao schools one finds here, think so. f013005: a giddying sight, schools of surface-feeding blue fish in a translucent blue sea. f013003: the moment of whoosh when they all decide to dive down. f042610: good diving can be had in Cleanerfish Bay, from very shallow seaweed gardens, to convenient depths. 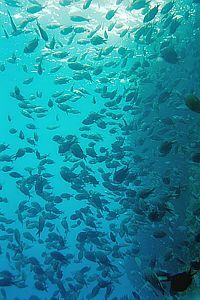 A snorkeldiver is observing a gathering of fish. 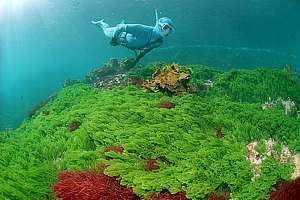 f042627: a snorkeldiver swims over a knoll with green sea rimu (Caulerpa brownii) and red seaweeds. 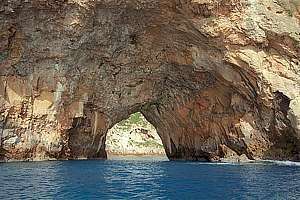 Contrary to Northern Arch, Middle Arch is in every way a safe place to dive: it is more shallow with only weak currents and it has shelves that one can rest on in case of emergency. 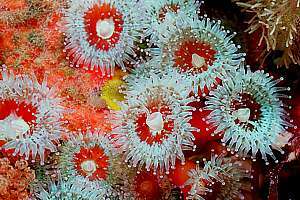 Middle Arch is a gold mine for macro photographers and marine ecologists because the merging of habitat boundaries causes unexpected biodiversity, variation and change. 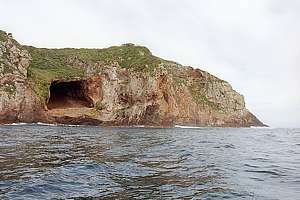 Most divers will begin at the southern entrance, enter Bernie's cave, go through the archway, veer left and around the promontory and back to the boat. 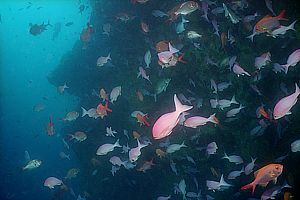 It is a very nice dive, crossing many habitat zones while seeing a high diversity in fish and other species. Around the promontory there will be some current and much schooling fish. Photographers will most likely stay around the southern entrance and Bernie's Cave for its many outstanding macro opportunities. 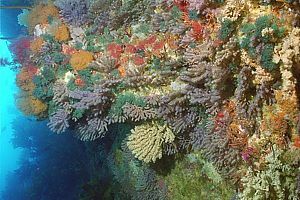 If you wish to see the deep reef, stay on the shaded side, left of the southern entrance and go down to 30m, where the beadlet gorgoneans are within diving range. 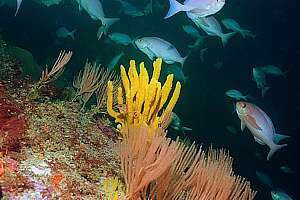 You will also see a good selection of colourful sponges and other cliff dwellers. f020336: the northern entrance to Middle Arch descends steeply to 50m near the bottom of the photo. On right the western wall with behind the far entrance, Bernie's Cave. f020500: a dive charter boat is arriving for Middle Arch and will anchor at the southern entrance over 23m depth. 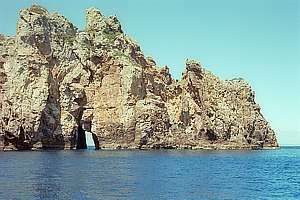 Bernie's Cave is where the nick is at the left side of the Archway, just in front of the ship's bow. f029907: the western wall is the most sheltered place of the Poor Knights, with a current. 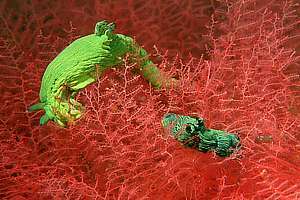 One finds these gorgonean fans no deeper than 5m. In between grow fragile bryozoan bushes, grazed upon by rare Tambja nudibranchs. f034921: a view of the riotous life just above Bernie's Cave, at the archway's most sheltered wall. f043213: the eastern wall is more exposed, yet covered in an unusual variety of life, often with unusual species. These sponges grow right under the surface! f024014: near the bottom, the archway becomes more barren. 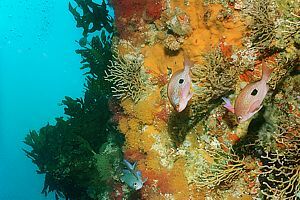 In the photo a pair of Lord Howe Island coralfish. f024206: Also the western wall becomes more barren towards the bottom. Here a school of young blue maomao is sheltering where the water moves least. Just behind the school is the entrance to Bernie's Cave. Bernie's cave (named after professional diver Bernie Keegan) is a safe cave because it is close to the surface, not deep inside, and its opening is very wide. At the top of the cave is an air bubble with enough space above it to take a breath and to talk. In the photo below, you can see the diver's light penetrating the bubble and at the top of the photo you can see the rock inside the bubble. Divers think that the air bubble is caused by diver's air but most of the air comes from tiny air bubbles produced by waves during storms. Through the water's surface, the air in the bubble is refreshed in the periods between diver visits. Inside the cave one can see the life petering out as planktonic food becomes scarce towards the end. 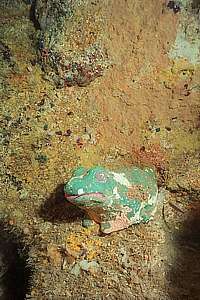 That is perhaps also the reason that two statues placed there, only slowly become fouled by encrusting life. Pay attention to the cave entrance, which is very rich, all the way to the surface. Here you can also find rare sea slugs. 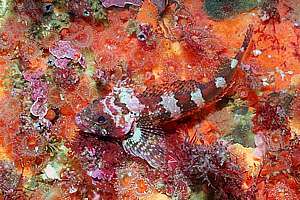 In the very back of the cave often the shy rock cod (Lotella Rhacinus) can be found. f024006: a diver enters Bernie's Cave, completely mirrored in the air bubble above. f024010: someone placed this little green frog here. Does anyone know the story? e-mail me. 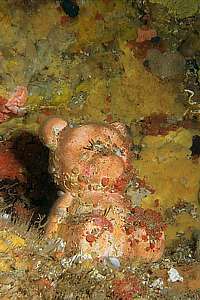 f029723: and someone placed this little bear here, now being covered by little red seasquirts. Does anyone know more? f019622: yellow zoanthid anemones thrive in the shelter of Middle Arch. f029121: close-up of yellow zoanthid anemones. 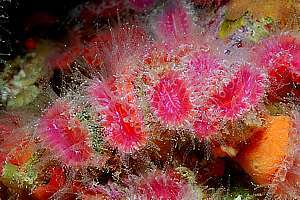 f029404: in the shelter and darkness of the Arch, delicate life forms thrive such as these red hydroid firs. 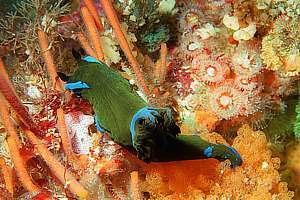 The green-lined tambja nudibranch is specialised in feeding on these little polyps. f029424: a greenish morose tambja (Tambja morosus) feeds on the tiny polyps of bushy bryozoa like the orange tufts on bottom right and the stick bryozoa on left. 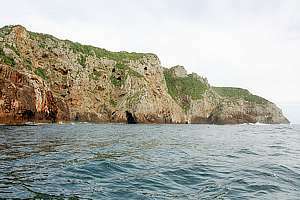 The cream gardens are marked by a large square cave above the water (see photo below). 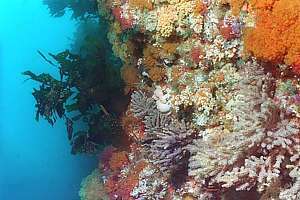 With some difficulty one can anchor there in 15-30m depth but very often this place cannot be dived because of heavy swell. 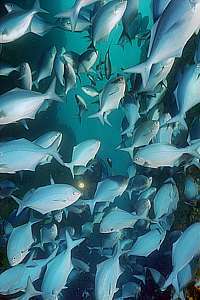 By swimming out along the promontory and diving down the cold upwelling to 30m, along a most spectacular wall, then towards the end of the dive spending time swimming back at 6-8m depth while decompressing and hopefully encountering some most spectacular bronze whaler sharks. These fish are very shy but stunningly beautiful. Imagine a golden shark with a white belly, no larger than 3m. 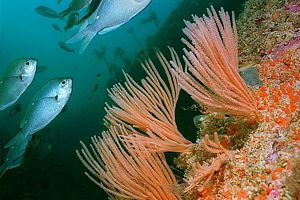 In this area there is also a lot of fish, both in open water and on the fiercely moving seaweeds. Here the swell races up a ramp that could catch you unaware, so stay away from the shallows and from white water. f216601: looking north to Wild Beast Point in the distance and a small promontory almost invisible right of the cave. 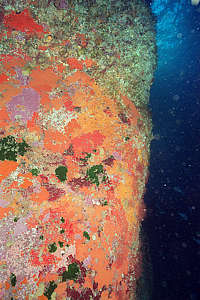 Just to the right of this point extends a long and very deep vertical wall, which is rich in sessile life. f041806: at its southern end, the wall ends suddenly, sending cold water up to the very surface. In this junction pink maomao find shelter to rest and sleep. Upwellings like these feed fish further south. f038732: towards the top edge of the wall one finds the more sturdy cliff dwellers. 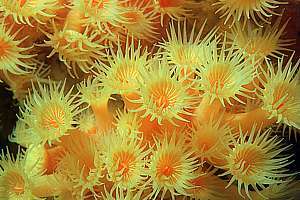 A large yellow boring sponge is being invaded by yellow zoanthid anemones. Kelp can just grow here but not further down. f038731: deeper down one finds bushy bryozoa of several kind, and gorgonean fans. 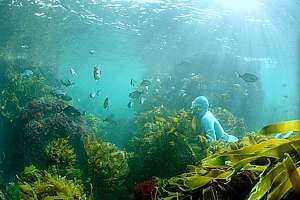 The kelp in the distance is scruffy and does not thrive at this depth and darkness. f041818: semi-pelagic fish that catch their food in open water but return to the rock at night, are found resting here. 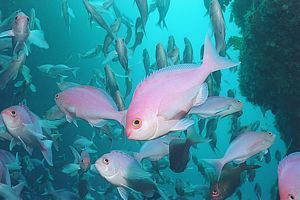 The pink fish are a male and female butterfly perch. Males have a green iridescent patch above their eyes. As its name suggests, Barren Arch is indeed mainly barren. There have been attempts to rename this arch more politically-correctly (Splendid Arch), but this is wrong because Barren Arch could well be the worst hell-hole in New Zealand. We spent an entire page (The mystery of Barren Arch) explaining why, which is very interesting. It is a unique place if only you knew why. But here is the short of it: during really big storms arriving from the north-east, the steep wall reflects and focuses waves into barren arch where they run up a ramp while accelerating to perhaps hundred kilometres per hour. This velocity moves one ton bricks as if they were autumn leaves, through the cave and up the ramp and out at the other end !!!!! Boulders that do not quite make it, roll back through the two deep grooves at the sides of the ramp. Quite unbelievable, but the solid evidence is there. So once in a while, Barren Arch is scrubbed clean, and only in the relative calm in between, can life reestablish itself somewhat. We haven't had a big tropical cyclone for a long time, so it seems that the arch is no longer so barren - just wait. 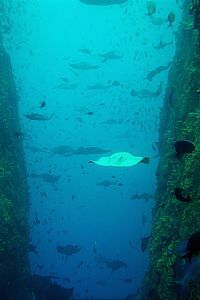 Diving Barren Arch is possible only after a long calm and westerly winds, so that the easterly swell has died down. Boats will anchor in the shallow part of the northern cove. Divers can then enter the cave the long and safe way, swimming south along the outside to the 40m deep entrance, or the more adventurous way, going over the ledge at its shallow northern end - quite daunting but possible at high tide. f012536: a yacht in the southern cove is dwarfed by the steep rock wall that extends steeply under water. Storm waves are reflected by this parabolic wall, and focused onto Barren Arch. f012537: this photo joins the one to the left as in a panorama, showing the deep entrance to Barren Arch. A small boat can enter and turn inside, but cannot pass the far end. 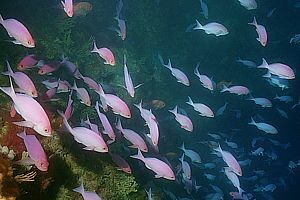 f024911: during ordinary weather conditions, the cave provides shelter to schools of fish like this small school of pink maomao. In front a mado. Notice the barren rock on left, and debris in the debris gully. f024914: a diver finds a large umbrella slug on the high ground (berm) between the ruts. On left the rut (debris gully) through which boulders roll. On right the higher middle ground with much more life. 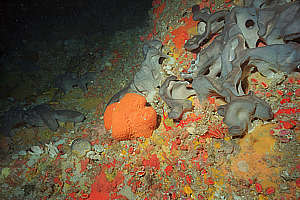 f024918: in the lull between major storms, sensitive life returns to the cave like these golfball sponges and an unknown grey sponge. f024910 (left photo): at the shallow end, the walls of the archway have been ground barren to several metres above the deep rut. There is a sharp boundary marking where the last storm ground all the life off. The wall feels almost like polished, and is covered in a pallet of velvet carpet sponges. 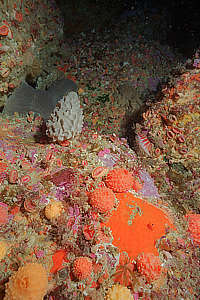 f024915 (photo above): detail of the band of life that was spared during last storm, above the band of carpet sponges. f024916: these mature sponges show that in some places, life has been spared for some fifty years. 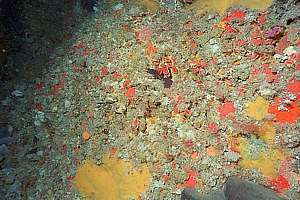 The grey sponge is Ancorina alata and the orange sponge a crater sponge Stelletta crater without crater. Notice how life peters out towards the deep groove far left. Cave Bay is a deep cove exposed to the worst of storms, but it has a rising staircase of large bricks that are doing a good job of absorbing wave energy, to such extent that at the very end a beautiful seaweed garden can be found, attractive for snorkellers, while its northern wall provides good night diving deeper than 10m, with an abundance of sensitive life forms. 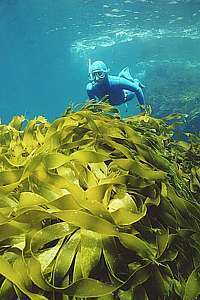 f048604: seaweed gardens at Cave Bay, with stalked kelp in foreground and strap kelp in the background. f048609: snorkeldiver and strap kelp (Lessonia variegata). 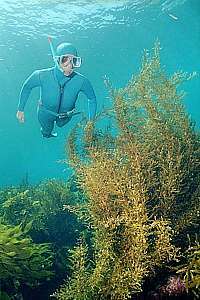 f048625: snorkeldiver and tall zigzag weed (Cystophora sp. ), and a variety of other seaweeds in the background. f048616: a black angel fish (Parma alboscapularis) parading its territory, but no edible seaweeds in this photo. The red fretsaw weed () in the foreground and the tough small-leaved wire weed (Carpophyllum angustifolium) in the background. f052535: a scalyheaded triplefin (Karalepis stewarti) on orange sponge and jewel anemones (Corynactis haddoni). 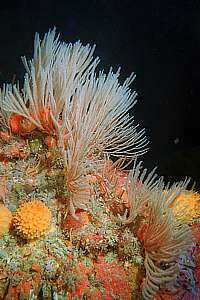 A night dive along the northern wall does not encounter gorgonean fans but a plethora of more robust cliff dwellers. f052507: hardy jewel anemones (Corynactis haddoni) thrive in rough conditions. f052504: cup corals (Flavellum rubrum, Momomyces rubrum) extending their tentacles far out in the turbulent waters.